Kofta is a very popular dish in many Middle-Eastern countries, and it is huge in Egypt. Kofta is basically the middle eastern version of a burger patty. It is made of minced meat that is mixed with spices, herbs, onion and garlic, it is then shaped into a log or patty if you prefer, heck it can be made into the shape of a meatball if you like, but generally I found they are log shaped. 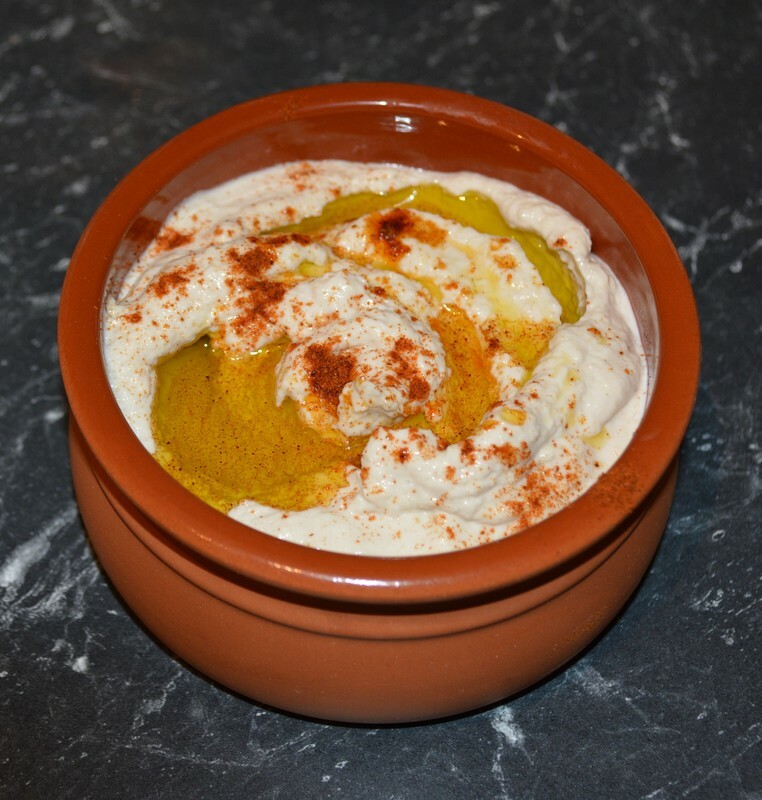 This is a simple recipe, each step is fast and easy to make, even the sauces are easy, I know you can buy tahini and yoghurt and cucumber dip, but it is so easy to make your own. If you prefer hummus to tahini, use that instead. ​The whole recipe comes together in about 20-30 minutes, and you get to feed you and your family (or friends) middle eastern burgers. Adding lamb to the recipe gives it a richer flavour, but feel free to leave it out and just use beef mince, if you prefer. Also buy regular mince, you want a little fat in this dish, otherwise your kofta could taste dry. My husband prefers the Kofta served as a meat dish at dinner, with the salads and dips on the side, everything separate, my kids loved it as a wrap. So serve it however you prefer. Try these soon, they were truly delicious and something different to the regular burger or wrap. 1/4 teaspoon salt, to taste. 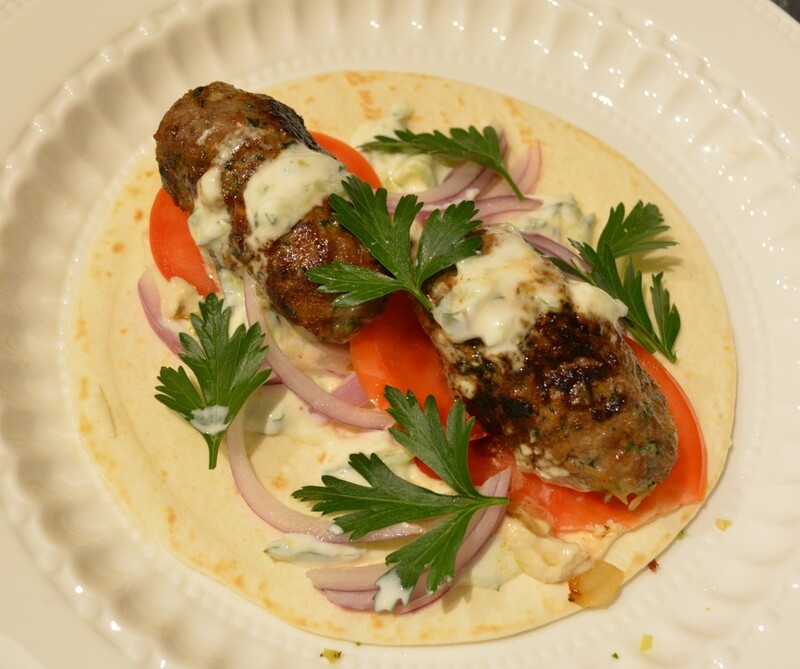 ​Make the kofta: In a food processor, combine the onion, parsley, garlic, salt, pepper, cumin and nutmeg. Process until very finely chopped, scraping down the sides as needed. ​Transfer the mixture to a large bowl, along with the beef and lamb mince. Use your hands to mix and knead everything together until the ingredients are evenly distributed. Try not to over-mix or overwork the mixture once it is uniform, as this may result in tough kofta. Shape the koftas: Shape handfuls of the kofta mixture into logs. The size of the logs is up to you. I prefer smaller ones, as they cook faster but you could make them slightly bigger than the loaves or wraps you plan to use for an easily-held sandwich. I just put two smaller ones in the wrap. If not using immediately, cover and refrigerate, until needed. To make the tahini: ​In a small food processor add all the ingredients, except for the garlic. Mix well until everything is well combined. Pour contents in a bowl, add the garlic and mix. Pour into serving bowls, add a teaspoon of extra virgin olive oil and sprinkle some coriander/cumin or red pepper flakes on top. To make the Cucumber and Yoghurt Sauce: Shred the cucumber and leave aside for 15 minutes. Place the yoghurt in a medium sized bowl, stir until smooth. Squeeze the juice out of the cucumber and add the cucumber flesh to the yogurt. Add the minced mint leaves. Add salt to taste, stir to combine. The dip is now ready. Serve in a bowl, garnished with olive oil and paprika. Place a large grill-pan, or any heavy-based frying pan, onto medium heat and leave it to heat up, you want it hot before you start cooking the kofta. ​Spray the pan with some oil spray. When the pan is hot, add the koftas and cook for about 2 minutes on the first side, then turn the koftas frequently until they are nicely browned and charred on all sides about 1-2 minutes per side. Lower the heat and cover the pan. Let it cook for 5 minutes, covered. Then uncover the pan and let any liquid evaporate. Assemble the rolls: Smear a generous amount of the tahini sauce onto your pita loaves/wraps. Add a few slices of tomato & onion and a small handful of greens, then top with a kofta while it is still super hot. 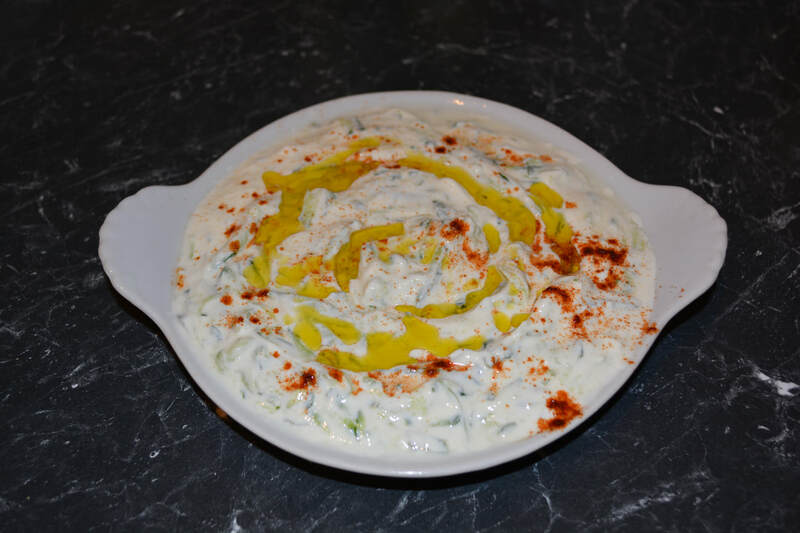 Drizzle with some cucumber and yoghurt sauce.